A missing 5-year-old Florida girl was most likely abducted from her home in rural Florida, police said Wednesday. Haleigh Cummings has been missing since 3 a.m. Tuesday, when her father’s girlfriend called 911 to say the child had vanished from her Putnam County home. “There’s no longer any reason to believe that the child simply wandered outside,” said Putnam County Sheriff’s Office Maj. Gary Bowling. The police must “assume abduction,” he said. “All the answers to why you’d want to take a 5-year-old are ugly,” Bowling said. Police have no official suspects, but are treating everyone they interview as one. “All the world’s a suspect” now, Bowling said. 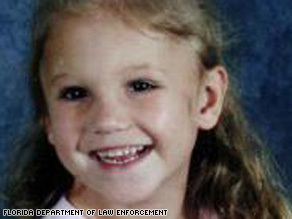 Hear the frantic 911 call » A nationwide Amber Alert says the girl was last seen wearing a pink shirt and underwear. Police plan to use infrared aviation technology after dark tonight in their search. “She’s a 5-year-old child, and she’s afraid of the dark,” Bowling said. On Monday night, Ronald Cummings’ girlfriend, 17-year-old Misty Croslin, was watching Haleigh and her 4-year-old brother, police said. Croslin put Haleigh to bed at 8 p.m. and then went to bed herself at 10 p.m., they said. Croslin told police she woke up at 3 a.m. and discovered Haleigh missing. Croslin then called 911 and told a dispatcher that she found a brick on the floor of the family’s double-wide trailer, according to CNN affiliate WJXT-TV. The station’s Web site printed the text of the 911 call, which included this exchange: Dispatch: OK. All right, you said your back door was wide open Caller: Yes, with a brick. Like, there was a brick on the floor. Like, when I went to sleep the door was not like that. The brick was actually holding open the door to the trailer, Putnam County Sheriff’s Office Lt. Johnny Greenwood told CNN. Croslin is staying with relatives as the investigation continues, said Bowling, describing the girlfriend as a “child herself.” Earlier Wednesday, Cummings pleaded for his daughter’s safe return. “All I want is my child … please … all I want is my child,” he said, his voice breaking. On Wednesday, Haleigh’s maternal grandmother, Marie Griffis, told reporters that she feared the worst. “She’s out there somewhere, I can feel her. I can feel her presence,” Griffis told CNN affiliate WFTV-TV. “She’s screaming.” Watch grandparents plead for girl’s return » Haleigh’s mother, Crystal Sheffield, wept as she stood in front of reporters. “I just want whoever’s got her to bring her home,” the girl’s mother said. “That’s all I want, is my baby home.” Watch mother’s tearful plea » Griffis said that her daughter and Ronald Cummings had a “rocky relationship” and that the two took turns spending weekends with their daughter. Sheffield lives near the Florida-Georgia line and has been interviewed by law enforcement, according to police. Investigators are looking into various angles of the case, including finding out the location of 44 registered sexual offenders who live within a five-mile radius of the Cummings home, Greenwood said. Though that number may sound high, it includes both Putnam and Palatka counties, which are separated by the St. Johns River, the law enforcement spokesman told CNN. Police are offering but not requiring all those interviewed in the case to take polygraph tests. Anyone with any information is encouraged to call the Putnam County Sheriff’s Office at 386-329-0800 or the Florida Department of Law Enforcement’s Missing Endangered Persons Information Clearinghouse at 888-FL-MISSING.